Myers’ Suriname toad is a truly bizarre EDGE amphibian. This Endangered amphibian from Panama incubates its eggs under the skin on its back! Myers’ Suriname toad has warty, filamented skin and a flat, sunken body that has the uncanny ability to look almost putrefied even when the individual is healthy. One bizarre adaptation is the tactile organs or lobes present on the finger tips which are used to detect food. When food is detected, the prey is taken to the mouth of the toad, which is both toothless and tongueless. It is likely that prey items are eaten in a ‘vacuum cleaner’ fashion. Unusually, Myers’ Suriname toads cannot assume the “standard” terrestrial-frog posture, with the forelimbs holding the body up slightly and their legs folded either side of their abdomen. Their resting position is instead characterised by their arms and legs splaying outwards in line with their flattened body. The family Pipidae is also referred to as the “tongueless frogs” or “clawed frogs”. Pipids are highly aquatic frogs that rarely, if ever, venture out of water. They have several adaptations to aquatic life, including the loss of the tongue (tongues are not generally useful for feeding in water), and the presence of lateral line organs, which are used to detection wave motion in water and are present in most groups of fishes (however, this lateral line system is unusually absent in adult Myers’ Surinam toads). Pipid toads diverged from all other living amphibians over 170 million years ago, some 20 million years before Diplodocus roamed the Earth! In turn, the genus to which Myers’ Suriname toad belongs, Pipa, diverged from all other Pipid toads more than 130 million years ago. In evolutionary terms, toads of the genus Pipa are more distantly related to all other amphibians than humans are to bats, rats, armadillos and aardvarks! As a testament to their high degree of Evolutionary Distinctiveness, Pipa toads have arguably the strangest and most elaborate of all amphibian mating behavior, in which eggs are deposited on the back of the female and the skin swells up around the eggs to encase them in pockets in which the embryos develop. 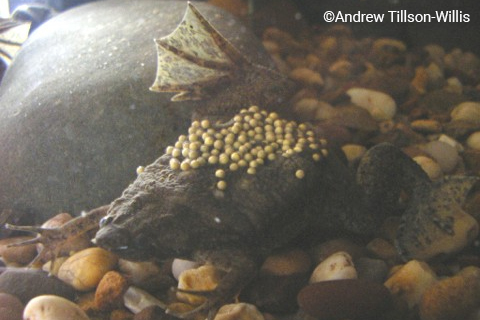 The eggs of Myers’ Suriname toad hatch out as tadpoles, but in other species the tadpoles are retained in the mother’s back tissues, emerging as fully formed froglets a little later on. Myers’ Suriname toad is listed as Endangered by the IUCN Red List as its entire range is less than 5,000 km2, across which populations are severely fragmented, and the extent and quality of available habitat is in decline in Panama. The major threats to this species are destruction of the forests surrounding the wetlands due to logging, agriculture and farming. Water pollution is also an issue. The species has been recorded from a protected area in Panama, but additional protection of the wetland habitat of this species is needed. The species has been recorded from the Río Ucurgantí and Río Canclón of Darien Province, Panama, and from Río Zulia in Norte de Santander, in northern Colombia. It occurs up to 30 metres above sea level. This species is aquatic and is restricted to swamps and other suitable wetlands such as lowland forest swamps. They eat aquatic invertebrates, crustaceans and fish. Females release 20-400 eggs during spawning, with a general average of 100. The eggs presumably develop on the back of the female. In the wild, the toads space themselves using calls to communicate location and distance.